I must be the world's worst gift receiver, because it can really take me AGES to finally get to reading books I've been lucky enough to get as gifts. Though I do really try. 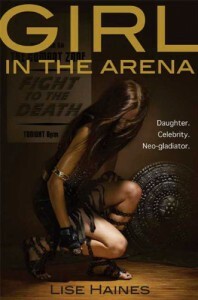 So I've owned Girl in the Arena for about two years now and have just gotten around to reading it. At the time I got it, I was SO excited because it was one of the first 'for fans of The Hunger Games' books I'd come across. And the summary did make it sounds like it would be right up my alley. Except that I'm slightly underwhelmed by the book itself. To me it seemed to be more about all the politics and the history of the GSA than actual fighting. And I was like: but, WHAT ABOUT THE FIGHTING?? It was as if you were reading The Hunger Games without the actual Hunger Games taking place. It seemed like Lise Haines wanted to tell us EVERYTHING about the Gladiator Sports Association and its origins and the plot suffered for it. I mean, I was expecting edge of my seat action while also having a girl battle her attraction to the guy who killed her seventh stepfather and instead the plot crawled by at a snail's pace. I really liked Tommy G., Lyn's stepdad, who sadly dies in the arena at his final fight. He seemed like a genuinely good guy and the right kind of stepfather, even if he and Lyn's mom perhaps didn't get married for the right reasons. I also liked Lyn's friend Mark, though only superficial, as I don't feel we got to know him very well. Lyn's mother on the other hand REALLY annoyed me! I thought she was selfish and made a lot of bad decisions and then expected Lyn to make the same ones. I did think the world that Lise Haines has created was really interesting and it's kinda scary, cause I could totally see something like this gladiator sport getting way out of hand and taking over lives. Lyn herself felt pretty detached from everything, which resulted in me failing to connect to her. I guess I just expected something a little more exciting than it was for me.